Kicks Off this #NASCAR Weekend! NASCAR Sprint Cup Series Race on behalf of Crown Royal. 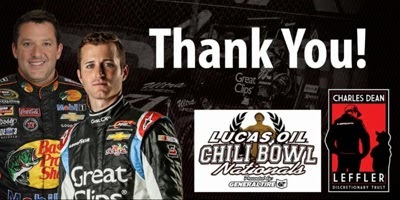 The local non-profit organization, dedicated to sending care packages to active-duty troops stationed overseas, has teamed up with Crown Royal to kick off the brand’s “Your Hero’s Name Here” program, which honors a deserving American hero by re-naming the July NASCAR race at Indianapolis Motor Speedway in his or her honor. 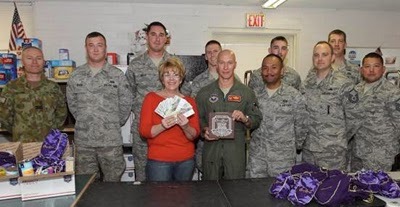 Packages From Home and Crown Royal will treat a group of local heroes from Luke Air Force Base to a VIP experience at this weekend’s NASCAR race. In addition to sending 20 military members to the race, two individuals are being recognized as the inaugural program nominees and will have the chance to have the legendary Indianapolis race named in their honor! 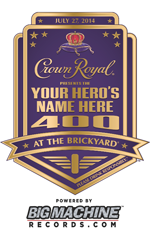 Consumers 21+ can visit CrownRoyalHeroes.com to nominate their own heroes, for a chance to win naming rights to the race. Nominations will be accepted through April 13th, with finalists being announced at the end of April. 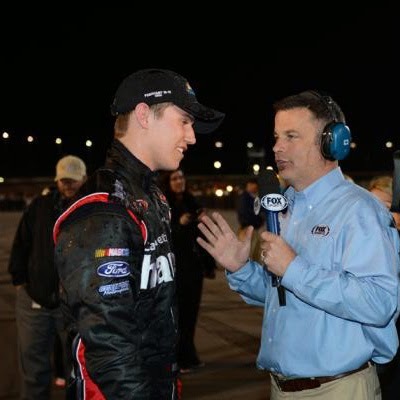 AVONDALE, Ariz. – Cole Custer had the checkered flag in sight four months ago at Phoenix International Raceway, but had to wait until Thursday night to get the win. Custer, 16, won the Talking Stick Resort 75, the NASCAR K&N Pro Series West season opener in the Arizona desert. The Ladera Ranch, Calif., driver started from the pole position and first had to deal with three-time Phoenix race winner Greg Pursley and then with a hard-charging Brennan Newberry on a green-white-checkered finish. In the November 2013 K&N Pro Series West season finale, Custer had a dominant car in leading practice, winning the pole position and leading every lap in the race – except for one. Gray Gaulding used a bump-and-run move on the white-flag lap to claim the win and send Custer spinning to a sixth-place finish. On this night, Custer led the first 10 laps before succumbing to the pressure of Pursley. However, on Lap 28 Custer regained the lead from Pursley, who tangled with lapped traffic on Lap 28 and drove his No. 00 NAPA Auto Parts/Haas Automation Chevrolet to victory from there. He built a lead of more than a second in the closing laps, but a late caution flag flew when Greg Rayl made contact with the Turn 4 wall on Lap 72 to set up the overtime finish and was able to edge a persistent Newberry at the line by .376 seconds. Nick Drake scored a third-place finish for Bill McAnally Racing in his K&N West debut while Pursley rebounded from the early trouble to finish fourth. Two-time NASCAR Canadian Tire Series champion D.J. Kennington came home in the fifth position. Dylan Lupton, Giles Thornton, Brandon McReynolds, Brett Thompson and Taylor Cuzick completed the top-10 finishers on the night. It was Custer’s first K&N West victory in just three starts. 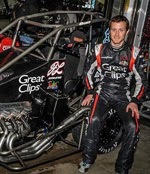 He collected a pair of K&N East wins last season in August at Iowa Speedway in Newton and in September at New Hampshire Motor Speedway in Loudon. Earlier in the day, Custer won the 21 Means 21 presented by Coors Brewing Company Pole Award. It was his second in the K&N Pro Series West to match the two he has in the NASCAR K&N Pro Series East. The Talking Stick Resort 75 will be telecast by FOX Sports 1 on Friday, March 7 at 1 p.m. ET. The NASCAR K&N Pro Series West is in action next on Saturday, March 22 in the NAPA 150 at Irwindale (Calif.) Speedway. It’s the first series race at the Southern California half-mile oval since July 2011. NASCAR created a highly sharable infographic compiling the most unique stats at Daytona, from social media buzz to food consumption. #NASCAR Driver Jeff Gordon Pulls It Off Again. Not only is Jeff Gordon a great NASCAR Sprint Cup driver; he is a very good actor. Racing champion Jeff Gordon teams up with Pepsi MAX to pull a prank on an unsuspecting automotive journalist who had questioned the authenticity of the original "Test Drive." This is a must watch video - very very funny! Sir just unlock the door and let me out! After 14 years of filling the skies, the “Spirit of Goodyear” airship retired after the Daytona 500. 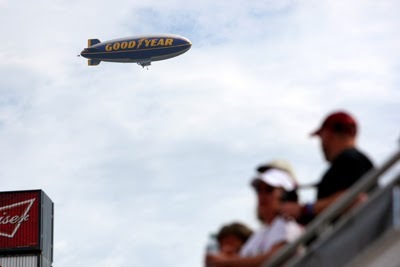 The Goodyear Tire & Rubber Company’s longest continuous operated airship was overhead to provide aerial coverage for its final events this weekend at Daytona International Speedway. Since its launch on March 15, 2000, The Spirit of Goodyear covered NASCAR races, as well as some of America’s biggest events including the NFL playoffs, MLB All-Star Games, NBA Finals, Preakness, Belmont States, U.S. Opens, and NCAA football games. As the Spirit of Goodyear retires, Goodyear is finalizing construction of an all-new Goodyear airship at the company’s Wingfoot Lake Hangar in Suffield, Ohio. Training flights on the new state-of-the-art airship are expected to commence in the near future. The new airship will begin a new chapter for Goodyear which has provided television networks with industry-leading aerial coverage since 1955. Goodyear began providing tires to NASCAR in 1954 and both companies are celebrating the 60-year relationship this year. Goodyear’s blimps are among the most recognizable brand icons, representing the largest tire company in North America. They have adorned the skies since 1925 and have served America as aerial aircraft carriers, surveillance airships protecting merchant ships and early warning radar stations through the 1950s. Today, the fleet consists of three North American airships - Spirit of America in Carson, CA; Spirit of Goodyear in Akron, OH; and Spirit of Innovation in Pompano Beach, FL. Just three past Phoenix winners – Gray Gaulding, David Mayhew and Greg Pursley – are on the Talking Stick Resort 75 entry list. Pursley leads active drivers with three wins and is tied for second with Richard Petty all-time at the Arizona track. Eleven Sunoco Rookie of the Year contenders are entered into the event with James Bickford and Nick Drake aiming to make their K&N Pro Series West debuts. The Talking Stick Resort 75 will be the 33rd stand-alone series race at Phoenix International Raceway. In addition, the series visited PIR for nine combination races with the NASCAR Sprint Cup Series from 1988 to 1996. The Talking Stick Resort 75 will be telecast on a delayed basis by FOX Sports 1 on Friday, March 7 at 1 p.m. ET. Ken Schrader’s four victories heads the list for most series wins at Phoenix (2001, 2003, 2004 and 2006). With three wins each, two drivers are tied for second on that list – Richard Petty (1978, 1980 and 1981) and Greg Pursley (2010, 2011 and 2013). Two-time winner Scott Lynch (2003, 2004) is the only other driver with multiple series victories at PIR. Pursley is tied with Mike Duncan for the most pole awards at PIR, with four each. Richard Petty won three poles at Phoenix. Others with more than one pole at PIR include Neil Bonnett and Scott Lynch, with two each. Pursley has the most top-five finishes in series action at Phoenix, with seven. Bill Schmitt holds the mark for the most top-10 finishes in the series at PIR, placing 10th or better in 12 of his 13 starts there followed by Austin Cameron with nine. Richard Petty holds the mark for leading the most laps (361) in series competition at Phoenix. Of drivers who have competed in four or more races at Phoenix, Neil Bonnett had the best average finish of 2.2 – making five starts between 1977 and 1982. Each of the last seven PIR races have ended at their advertised distance while six of the previous seven were extended for green-white-checkered finishes. With 21 starts, Brett Thompson has competed in the most NASCAR K&N Pro Series West stand-alone events at Phoenix. Jack Sellers has the most PIR starts overall – racing in 18 stand-alone events and five combination races. Among manufacturers, Chevrolet has the most wins in series action at PIR with 15 wins. Eight of the 32 series races at Phoenix were won by the pole winner, including this race a season ago. Three race winners started outside the top 10. Rich Woodland Jr. started the furthest back and won, coming from 21st on the grid in 1998. This year, Goodyear celebrates its 60th anniversary as a key supplier to America's most popular motorsport – NASCAR, making it not only one of the longest-running supplier relationships in racing, but in all of sports history. "All of us at Goodyear are extremely proud to celebrate 60 consecutive years of supplying race tires to NASCAR and its drivers," said Stu Grant, general manager of global race tires. "Since 1954 our involvement in NASCAR has been a proving ground for tire development, helping Goodyear provide superior performance and innovation both on and off the track." As part of the 60th Anniversary celebration, Goodyear has teamed up with Stewart-Haas Racing Driver Kevin Harvick to create a new “Tire Talk” video series. These videos showcasing the grueling conditions NASCAR tires face in a fun and entertaining manner! You will love the creative comicality in the three Goodyear videos posted below. NASCAR Race Mom watched them numerous time – funny yet NASCAR educational. They really help to demonstrate the incredibly challenging demands that are placed on Goodyear’s Eagle NASCAR tires each weekend. Let The Sight Of 3000 Rotations A Minute Leave Your Mind Spinning. Catch A Glimpse Of 200 MPH In Action. Get A Feel For What It Means To Face 3Gs In A Turn. Much like the cars of NASCAR have evolved over the decades, today's Goodyear Eagle race tires bear little resemblance to the standard auto and police tires used in the early 1950s. Goodyear's dedication to tire performance led to purpose-built treaded bias race tires in 1957, to slick bias race tires in 1974, to the first radial racing tires in 1988, and just last year to the introduction of race tires using Goodyear's exclusive Multi-Zone Tread Technology. "The evolution of our NASCAR racing tires has been a very exciting and rewarding project," said Grant. "We are looking forward to the next 60 years." Goodyear is one of the world's largest tire companies. It employs approximately 69,000 people and manufactures its products in 52 facilities in 22 countries around the world. Its two Innovation Centers in Akron, Ohio and Colmar-Berg, Luxembourg strive to develop state-of-the-art products and services that set the technology and performance standard for the industry. Click Here For More Information About Goodyear. NASCAR Race Mom spent three fun packed days playing in Laughlin, Nevada this weekend. Yes I know that was the Daytona 500 weekend. Not to worry, the race was streaming from televisions in every casino and restaurant we frequented. That was a good thing too; what with the six-hour – twenty minute rain delay – it would have been criminal to be stuck in a room somewhere waiting with the rest of NASCAR Fanatics. If you are not familiar; Laughlin is a sliver of the Colorado River Valley where Nevada, California and Arizona meet. The city by the river now attracts nearly two million visitors annually and experience gambling and high-profile special events. Our group of four fun seekers relished our premium seats to the LeAnn Rimes concert. LeAnn Rimes is an American country and pop singer and her rich vocals entertained us on Saturday night. 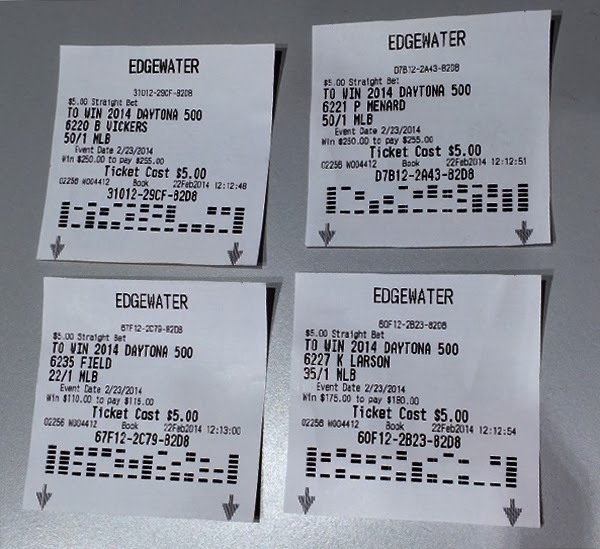 Sunday was dedicated to the ‘500.’ NASCAR Race Mom had placed her bets early. You can do that in Laughlin! NRM put $5.00 each on Kyle Larson, Paul Menard, Brian Vickers, and Cole Whitt. Since Whitt was not listed separately, the bet was a “field” bet. Although Dale Earnhardt Jr. is one of NASCAR Race Mom’s favorite driver, I resisted the urge to bet on him. Probably a good thing, because the NRM jinx hit all of her Daytona 500 picks. Sprint Cup Rookie Kyle Larson hit the wall at Daytona International Speedway twice in the opening laps of Sunday’s race. He was the first one drivers out of the race! Paul Menard, in a backup car due to a wreck during Wednesday’s practice Wednesday, had led three times for twenty-three laps, getting to the front for five laps before the rain delay. He was also strong through the first full-field round of stops. Unfortunately, a twelve-car wreck on lap 145 caused significant damage to the front of Menard's car. Repairing that damage cost him sixteen laps and he finished the race in thirty-second place. "I had a really good car," Menard reported "We kind of got messed up on pit sequence a little bit, came out by ourselves once and got shuffled back, and that's about when everybody decided to wreck." Brian Vickers fared a tad better. He managed to stay up front in the top five before the cycles of pit stops. 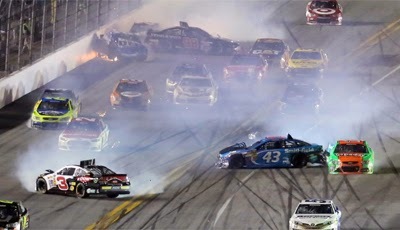 Then on lap 162, he was collected in a multi-car incident when Pole Winner, Austin Dillon’s race car broke loose and triggered the pile up. Brian jumped to the high side, slammed on the brakes, but it was just too much, too fast- and he suffered significant damage to the car that dropped him out of contention and crossed the stripe at the end in 30th place. “We had a good car, but just got caught up in one of the wrecks. A couple of those guys were just racing really aggressive and bouncing around, moving a lot. I knew it was a matter of time.” said Vickers. NASCAR Race Mom still had one driver in the ‘Great American Race’ and had high hopes for Sprint Cup Rookie Cole Whitt. His race was going exceptionally well. Unfortunately, Austin Dillon gave teammate Ryan Newman a hard bump, sending him into the wall as he took out all the cars behind him. Yup, Cole Whitt was there and painted the Daytona Speedway wall his #26 Speed Stick Gear Toyota. Whitt finished the race in 28th position. “We were in position for a great finish. I was nursing the No. 26 Speedstick GEAR Toyota late in the race because of some water pressure issues but with 20 to go crew chief Randy Cox gave the order that it was ”time to go.” We raced up into the top 20 but then got caught up in a wreck that also collected my teammate Parker Kligerman.” Whitt explained. Bad News: NASCAR Race Mom did not win on any of her bets! Good News: Dale Earnhardt Jr. dominated a frantic two-lap dash to the finish to win his second Daytona 500. Best News: NASCAR 2014 is here and made its arrival known with a thrilling event with a “feel good” ending. 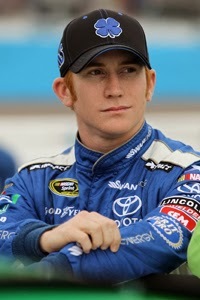 *****Keep your eye on racing youngster, Cole Whitt. NASCAR Race Mom is predicting great finishes for him in his rookie season. One of this year’s Sprint Cup ‘Rookie of the Year’ candidates, Cole Whitt, is a hometown boy. He was born and raised in Alpine, California. NASCAR Race Mom has been following him since he first sat behind the wheel of a go-kart. As a youngster, Whitt was an advocate for the El Cajon Lions, Tigers & Bears (LTB) organization. It was impressive that one so young could work towards such an honorable pursuit. 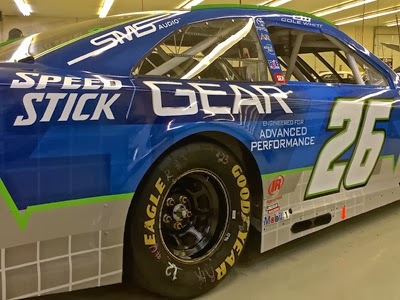 Last week, the Speed Stick GEAR team announced a new partnership with Cole Whitt. As part of this new partnership, Speed Stick GEAR has proudly become the primary sponsor of Whitt's No. 26 car for Swan Racing during the 2014 Daytona 500. Today, Cole Whitt will attempt to put aside his misfortune* during the first Daytona 500 practice run to race his way into one of the most important and prestigious races on the NASCAR Calendar – the NASCAR Daytona 500. Whitt will need to finish fifteenth or better in the Budweiser Duels – Race 1 from a field of twenty-five. NASCAR Race Mom thanks Cole Whitt for taking a few minutes out of his hectic schedule to answer a few questions. NASCAR Raced Mom: What is your major focus for your first full-time NASCAR Sprint Cup Season? 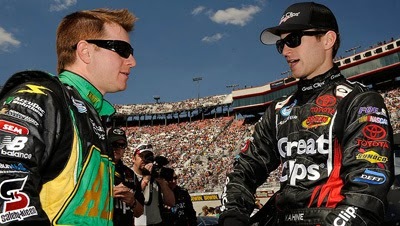 Cole Whitt: We want to win Rookie of the Year. If we can do that, that would be amazing. But at the same time, I think that growing with the team is going to be more important than anything; over time, just becoming better and watching the team go from a top thirty-five team to a top twenty-five team is what I look most forward to doing. We are a small team and we are trying to taking on some very big competition. I would not like to do that with any other people. Team owner Brandon Davis has been great to us. He has helped straighten out a few things and put us in the right perspective. He always keeps me upbeat and helps me stay professional in what I do. I’m pretty excited about what we got coming up. I am really confident in my guys and we have Speed Stick on board. NASCAR Raced Mom: 2014 should prove to be a difficult season for the ‘Rookie of the Year’ candidates. So many qualified drivers will be sporting that yellow stripe on their bumper. Cole Whitt: They say that it is one of the most talented group in years. Part of that is a bit of an honor in itself, for people to think that way. We definitely think that we have a shot at it. NASCAR Raced Mom: How have you prepared yourself, both physically and mentally, to tackle the challenge? Cole Whitt: I think I have covered myself by doing intense workouts; lots of cross fit type of workouts. I try to keep myself in the best shape physically as possible. I believe that helps mental prepare you as well. 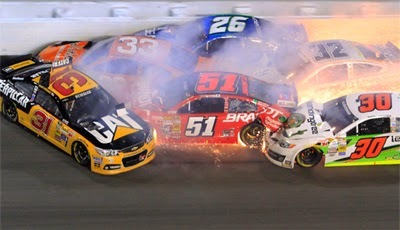 NASCAR Raced Mom: Does an incident like yesterday’s “oops” during practice effect you mentally at all? Cole Whitt: No, not really except that I would have like to have gotten more practice obviously and more time on the race track. But you cannot control some things and getting a flat tire had nothing to do with our team or anything we did; it was just unlucky. Fortunately, the car is ready for the duel and we are going to be just as good as we were. NASCAR Raced Mom: Have you done any restrictor plate racing? Cole Whitt: Just with the Nationwide stuff. I ran the Cup race at Talladega last year and got some really good experience and will hopefully be able to put that to use. In the Nationwide and Truck series that I came through, I did some Daytona races there. I have different experience at different levels, but nothing to this stature. Daytona is definitely the biggest race of my career and also our biggest race of the year. NASCAR Raced Mom: You and teammate Parker Kligerman are both in the first duel race tonight. Is that a good thing or bad thing? Cole Whitt: I think that is definitely a good thing. If we can get together, that is going to be great. If we get that opportunity, we will get together and do whatever we can. Not sure we will get that chance. After yesterday . . . . nothing is for sure in NASCAR. NASCAR Raced Mom: As the mom of a racer, I know that watching your son compete on the track can be very nerve racking. How does your mother handle that stress? Cole Whitt: I don’t know but she does really good. I don’t know how to describe her other than she is a saint. She has done a lot for me; my whole family has made sacrifices for me. For it to pay off and for me to get this far and be able to run the Daytona 500 is pretty amazing. It is huge for my family. My Mom and Dad are down here. It is pretty special just to have that. NASCAR Raced Mom: Do you have anything you would like to add? Cole Whitt: Yes, one thing that I want to add . . . there is a documentary being done with Speed Stick GEAR which will be on the Speed Stick YouTube Channel. It will have behind the scene stuff that covers a lot of personal stuff with me. You will learn a lot about me, more than just interview questions. It will cover all that I had to go through during the week before the biggest race of my career. I think that it will be a pretty cool piece! NASCAR Race Mom enjoyed her interview with young NASCAR ‘up-and-coming’ Cole Whitt. He proved to be articulate and very pleasant. NASCAR Race Mom is glad that Cole mentioned the Speed Stick GEAR Documentary. Personally, I cannot wait to see it and hopefully post some of it on this blog. The Daytona 500 will take place on Sunday, February 23, 2014 and is televised nationwide. You can watch the Cole race in the qualifying race of 60 laps, or 150 miles, tonight. These races will air on FOX Sports 1 beginning at 7:00 pm ET. Green flag start time for Cole Whitt’s race is set for: 7:19 pm ET. * Four laps into Wednesday afternoon's practice session, Whitt scraped the outside wall after a piece of debris punctured the nose of his No. 26 Swan Racing Toyota. In an attempt to avoid Whitt's car, Brian Vickers collected Casey Mears' Chevrolet and shot nose-first into the outside wall, NASCAR Wire Service reports. DAYTONA BEACH, Fla. – Daniel Suarez isn't slowing down. The 22-year-old from Monterrey, Mexico, made it 2-for-2 in 2014 with a dominant performance on the short track at Daytona International Speedway Tuesday to capture the UNOH Battle At The Beach. Suarez led the final 119 circuits of the 150-lap event for his third career win. He won the season-opener on Sunday at New Smyrna (Fla.) Speedway, just down the road from Daytona, and in the process became the first driver since Sean Caisse in 2006 to start a K&N Pro Series East season by winning the first two races on the schedule. Suarez also delivered Rev Racing and NASCAR's Drive for Diversity program its 14th victory since 2010. His first NASCAR K&N Pro Series East win was earned in 2013 at Columbus (Ohio) Motor Speedway. Austin Hill crossed the finish line second at the .37-mile oval at “The World Center of Racing,” while Brandon McReynolds was third. Nick Drake and Lee Pulliam rounded out the top five. Kenzie Ruston was sixth, followed by Gray Gaulding, Patrick Staropoli, Scott Heckert and Kaz Grala. Ben Rhodes, who earned the 21 Means 21 Pole Award by Coors Brewing earlier in the day, settled for a 15th-place finish after he suffered damage from an incident midway through the event. The UNOH Battle At The Beach doubleheader, which also included a NASCAR Whelen Modified/NASCAR Whelen Southern Modified Tour special event, aired live on Fox Sports 2. The K&N portion of the event will be rebroadcast on Wednesday, Feb. 19 at 5:30 p.m. on Fox Sports 1. Suarez's New Smyrna win will air on FOX Sports 1 on Saturday at 9 a.m. The NASCAR K&N Pro Series East will continue its 2014 campaign with the PittLite 125 on March 15 at Bristol (Tenn.) Motor Speedway. For comprehensive coverage, check out Race Central Live Powered By Speed51.com: Florida. Lionel Racing has randomly inserted more than 700 Golden Tickets in their 2014, 1:24th scale die-cast! If you find a golden ticket, you could win great prizes such as VIP race experiences, driver meet-n-greets, autographed race-used items and more! Shop the Official NASCAR Trackside Merchandise Trailers, team gift shops, the NASCAR.com Superstore or your favorite retailer to purchase a 2014, 1:24-scale die-cast and then be sure to check your die-cast box for a Golden Ticket! Cameron Hayley in just his second NASCAR K&N Pro Series East start won the 21 Means 21 presented by Coors Brewing Company Pole Award in qualifying on Sunday for the New Smyrna 150 presented by JEGS at New Smyrna Speedway. However, the Monterrey, Mexico, driver Daniel Suárez held off Cameron Hayley in an exciting door-to-door battle of NASCAR's rising stars to win the New Smyrna 150 presented by JEGS Sunday night at New Smyrna Speedway. The race was the NASCAR K&N Pro Series East season opener and the inaugural visit to the banked half-mile. 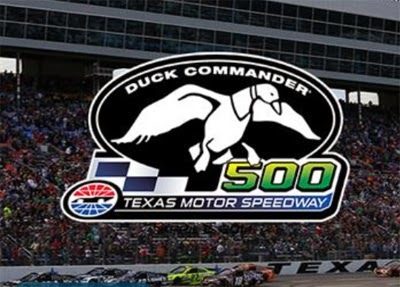 Tickets for the Duck Commander 500 officially go on sale today. Duck Commander, the brand of the best-selling duck calls and name of the thriving family-owned company led by the Robertson clan of A&E’s "Duck Dynasty" fame, has signed a multi-year agreement to serve as title sponsor of the annual spring NASCAR Sprint Cup Series race at Texas Motor Speedway. "This is perhaps the most unique sponsorship in professional sports because not only does this come with special branding, it comes with celebrity spokespeople that are followed by tens of millions of people every week," Texas Motor Speedway President Eddie Gossage said. "Fans will see members of the Robertson Family and cast of Duck Dynasty and all the rest during Duck Commander 500 week here at Texas Motor Speedway and we have produced some awesome merchandise that both race fans and Duck Commander fans will love. This marriage is perfection." "We’re excited about the partnership for the Duck Commander 500, being aligned with NASCAR, and to have our brand associated with an event of this magnitude," shared Duck Commander CEO Willie Robertson. "We are all big fans of NASCAR and have been all our lives. It’s especially exciting to see our brand join to make it an awesome experience for the fan base and we can’t think of a better place than our neighbor at the Texas Motor Speedway." While the Robertson family emerged in the public eye and garnered immense popularity through A&E’s "Duck Dynasty" reality show that premiered in 2012, the Duck Commander brand has been the foundation of the family business of duck calls since patriarch Phil Robertson founded the company in 1972 in West Monroe, La. The Duck Commander brand also will enjoy a substantial product presence on its race weekend and throughout the year at Texas Motor Speedway. An extensive line of Duck Commander 500 merchandise will be sold at track and in the Speedway World souvenir store year-round in addition to being available through Duck Commander retail partners. Tickets for the Duck Commander 500 officially go on sale Friday, Feb. 14. Fans interested in purchasing tickets prior to that date can do so by securing season tickets or by joining the Texas Motor Speedway Fan Club. Fan Club members will be eligible for a special Duck Commander 500 pre-sale event that begins 9 a.m. CT Friday. For those interested in the Fan Club, please visit www.texasmotorspeedway.com/fan-zone/join. NASCAR Race Mom loves Duck Dynasty! Further NASCAR Race Mom's oldest son lives in the Fort Worth Area! Attending this race would be a dream come true. Saint Valentine's Day, also known as Valentine's Day or the Feast of Saint Valentine, is observed on February 14 each year. No date for Valentine’s Day this year? Or do you and your significant other share a passion for NASCAR? Either way, FOX Sports 1 has a memorable night planned that is sure to get everyone’s heart racing. 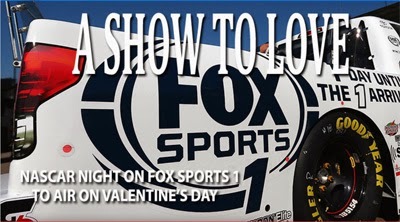 Spend a sweetheart of an evening with your favorite racers as "NASCAR Night on FOX Sports 1" delivers a three-and-a-half-hour block of primetime NASCAR programming right after the network’s live on-track coverage of the opening day of NASCAR Sprint Cup Series practice at Daytona International Speedway on Friday, Feb. 14. An encore presentation of THE DAY: REMEMBERING DALE EARNHARDT (10:00-11:00 PM ET). "Daytona Speedweeks is the most anticipated two weeks on every NASCAR fan’s calendar each year, and with the return of the No. 3 and various competition and championship format changes, interest is at an all-time high," said FOX Sports 1 & FOX Sports 2 General Manager & COO David Nathanson. "Daytona has produced some of the sport’s most memorable, historic and tragic moments throughout the decades, and on Valentine’s Day, FOX Sports 1 and NASCAR Productions shine a spotlight on what makes NASCAR so beloved by millions of race fans." The 2014 NASCAR Home Tracks season is set to launch in Florida with the UNOH Battle At The Beach on the short track at Daytona International Speedway and the World Series Of Asphalt Stock Car Racing at New Smyrna Speedway.